Me: Hey, guess what? I wore the jumper you said looked nice on me on Sunday. I sat down for lunch and then walked away. Then, while walking I felt a sudden breeze on my tummy. I realized that the jumper has torn into 2 parts !!! I had to hold on to the jumper till I got home. Friends: Oh my gosh ! I’m so sorry. The stock is not mine. I’m helping my friend clear stock. Please bring it back to the store and exchange it for something else. I’m really sorry. Me: Sure, no problem. I’ll come by this week. I then exchanged my torn jumper for a pair of heels. Me: Hi, I hate telling you this. The shoes I purchased from you recently is torn. I wore it for one day and by mid day, both shoes at the front end ripped itself off. Friend: What you mean torn ? Aiyo, how you wear shoes one? So “cho lo” (rough). Wear shoes also can get torn ! Me: This is my first time buying a pair of heels and it got ripped apart when I wear it on the day itself. I’ve been wearing shoes for almost 20 years now ! Never once, I torn the shoes on the first day. Friend: This is my first time customer purchase from my store and came back twice with damaged goods! I think you really need to learn to take care of your clothings/shoes better. Friend: Nevermind, only for you. Since you are my friend, bring back the damaged shoes to me and I’ll you can get another pair of shoes. Me: No, no, no. I don’t want an exchange. I just want to let you know that perhaps you should not consider getting your stock from the supplier. His quality is not so good. Friend: What you mean, not so good ? ! No one ever complained. Only you, don’t know how you wear clothes and shoes, one ! Clothes also can koyak, shoes also can get ripped apart ! Me: *Silence* It’s OK then. Just thought you’d like to know. And my friend wonders why business is not so good for her. Your Inner Genius is the fullness and wholeness of you. “You are exactly where you deserve to be” exclaimed Mr. Robinson. The words still echoed in my heart. I carry these words with me since the day I heard it. It was 10th October 2009. Seated in the room was approximately 40 persons.All enthusiastic to discover the secret of reaching financial freedom – “How to go from broke to millionaire in 3 years” . I was merely one of the curious one. If I could paint a picture of my emotions that day, it would be a thunderstorm, with grey clouds and flashing lightnings. I have never felt so confused, angry and discontented. It was as if I was given an algebra or a physic equation that has no answer. No, if was if I was given the Einstein theory and was expected to turn the world around. I wanted to shout with all my might – WHY ! Dear God, WHY ! What went wrong ? Where did I do wrong? A flashback of my bank account vividly broadcast in my mind. I surely DO NOT DESERVE this ! I couldn’t focus much what was said anymore. My mind separates from me. Moments later, I woke up. My subconscious mind awoke in tremor. I am not the same person I was that day I walked into the room. On the 29th October 2009, I experience a life changing experience. Sat in the small business meeting room, the 3 of us coached around the round table. Both the foreigner were so huge physically, I felt so small. I may be small in size but I never accepted my life to fate. I am who I am I want to be. Today, I want to be rich. I deserve to be rich. I presented my proposal with confidence, as I always do with any presentation. This time, it was different. I was different. I couldn’t explain it but I knew it. The aura around me was fuming, the energy was so strong I sense the room grew bigger each time they nodded in agreement with whatever I said. At the end of my 30 minutes presentation, the 2 gentlemen practically jump off their seat and said to me. “We want 2000 of this, but we don’t need this now. In 2 months time, we will be back in Malaysia. For now, can you give us 50? ” I trembled. I didn’t know what to do. I called Mr. Robinson. ….. The phone call lasted 3 seconds. I then proceeded hastily with the paper work. They signed the deal. It was RM9000. 3 hours later, I met the gentlemen in Midvalley. They withdrawned RM8100 CASH, after discount of 10%. I came back to the office, carrying RM8100 cash in my handbag. When I walked into the Admin room, I collapsed in tears ! Literally, tears of joy counting money !!! I couldn’t believe it with my own eyes. “Know when to close the deal and suddenly grow rich“ by Marco Robinson. THANK YOU MARCO. You and your book has changed my life, for the better. I feel richer and I am richer everyday, because of you. 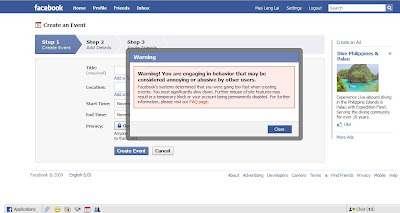 I am Annoying – Says Facebook ! I have luxury of time this morning. I sat in front of my laptop and started creating schedules to set a reminder for myself. I love the Event function in Facebook. It really helps me organize outings and activities with my friends. By the 4th event I tried creating, I received a prompt warning. Flashing boldly on my screen – YOU ARE ANNOYING AND A NUISANCE TO OTHERS ! It couldn’t be any obvious.